There are three primary entities (tattvasThe ancient philosopher-scientists who were the originators of the Vedanta and the Purana seem to have had a special interest in the ontological analysis of entities around them—in analysing their essential characteristics and classifying them according to category of existence. Sankaradeva’s studies represented a continuation of the same approach. The word that comes up frequently in this context in the works of the key personalities of the Eka Sarana school is “tattva,” standing for “entity.” It has a special ontological connotation. ), numerically speakingWe say “numerically” because although from the point of view of enumeration, these three would represent three tattvas independent and distinct, from the standpoint of essential characteristic, there would be only two entities: (a) prakrti and (b) purusa. As both purusa and parama purusa would fall into the same ontological category. This is made clear later in the section on the difference between the embodied personality and the Lord., in the philosophical scheme of Sankaradeva: (a) primal matter (prakṛti); (b) pure personality (puruṣa) and (c) the supreme pure personality (parama puruṣa). The supreme entity is God (parama puruṣa) referred to in his immanent capacity as Kṛṣṇa. He is supremely conscious (caitanya p&umacr;rṇa). He is termed as the supreme truth (satya). The living beings (jīva) are also, in truth, pure personalities (puruṣas). There is thus discussion in the Sankaradeva-ite philosophical literature on the nature of reality—specifically, on what constitutes the essential nature of entities (tattva). The difference between the material (jada) and spiritual (caitanya) is critical in Sankaradeva; it determines worship in the Eka Sarana school. The pure personalities (puruṣas), due to non-devotion to God (parama puruṣa), become forgetful of their own spiritual nature and fall into prakṛti and become dead and extremely matter-like (jaḍa). In ignorance (avidyā, ajñāna) and illusion (māyā) the pure personality (puruṣa) thinks himself to be a part of primal matter and considers himself a material entity. In the state of ignorance, he does the worship of prakṛti and its evolutes. It is this false apprehension and non-discrimination that forms the basis of his entrapment in the cycle of births and deaths (saṃsāra). Given this philosophical background, Sankaradeva exhorts the jīvas to take refuge solely in parama puruṣa in the form of Kṛṣṇa and do pure devotion (bhakti) only to him. Kṛṣṇa is supremely conscious (caitanya) personality while primal matter (prakṛti) and ‘her’ evolutes are unconscious (jaḍa) substance. The jīvas too are essentially conscious (caitanya) and spiritual and ontologically superior to prakṛti. Therefore, it behoves them to do pure devotion (bhakti) only to Kṛṣṇa. The supreme pure personality, who is Parama &Imacr;śvara (God, Supreme Lord), is the controller (niyantā) of both puruṣa and prakṛti. The term mahāpuruṣ&imacr;yā (from mahāpuruṣa, the supreme pure personality) is also sometimes found applied to the religion of Sankaradeva. It implies the worship (upāsanā) of parama puruṣa Krsna. He is superior to both prakrti, primal matter, and purusa, the pure, spiritual personality. He is the cause, as it were, of these two entities. Mādhava is the ordainer of both prakrti and purusa. Hari is the (supreme) soul and great benefactor of all. By the term ‘kṣara’ is meant the body. 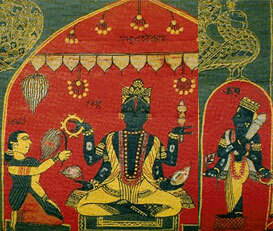 By the ‘akṣara’ term, the spiritual personality (brahma). Thou the best purusa, the supreme purusa and Master of Supreme Joy. I seek refuge in thee for the nectarine juice of thy lotus feet. While primal matter (prakṛti) is unconscious substance subject to modifications (vikāra), pure personality (puruṣa) is conscious and immutable (avikārī). Both puruṣa and parama puruṣa are conscious pure personalities and, therefore, essentially similar. Both are quite unlike matter. As Sankaradeva lucidly explains in his Bhakti Ratnākara, in the chapter on the difference between jivātmā and paramātmā, the jiva—puruṣa connected to mind and the senses—is not different, ontologically, from paramātmā (parama puruṣa). However, (from the point of view of degree of consciousness) parama puruṣa is supremely conscious while the puruṣa is not so. The consciousness of parama puruṣa is uneclipsable but that of puruṣa is eclipsable. In the default state, puruṣa is not only affected but almost crushed by the illusion (māyā) wrought of matter. On the other hand, the guṇas of prakṛti cannot even touch the supreme pure personality. He is the personality of supreme transcendental joy. the supremely conscious form of the Lord. the happiness born of own-joy of the jiva. he is suffering greatly on account of them. byaẏa āche tāra	abyaẏa howaẏa jīwa nitya abināśī .. sukha-duḥkhamaẏa	māẏā-moha pāśe bhailā ati bimohita . karmma-jarī-baddha	huẏā saṃsārata pari duḥkha pāwe nita .. 772 īśbarata kari	jīwa bhinna nuhi śānta abikārī haẏa . bhrāntiẏe ajñāna	ābarita huẏā āponāka najānaẏa ..
he, like His Lord, is also always-existing and indestructible. he has fallen into extreme delusion. he is calm and immutable. bhrāntijñānāvṛto bhūtvā nātmānaṃ vetti tattvataḥ . According to Sankaradeva, only by the listening (śravaṇa) to and singing (kīrttana) of the immanent Lord’s glories—in an attitude of sole-refuge (eka śaraṇa)—would the jīva be able to overcome the nescience (māyā) wrought by primal matter (prakṛti) and obtain the supreme happiness and not otherwise. the great and rare deliverance. hear, O all enlightened people! This article is a reproduction of An Introduction to the Philosophy of Sankaradeva written by Arunava Gupta. It is available on his blog sankaradeva.wordpress.com. Gupta, Arunava. “An Introduction to the Philosophy of Sankaradeva.” ‘পাইবা ভক্তি পৰম নিৰ্ম্মল’ , https://sankaradeva.wordpress.com/2019/02/22/an-introduction-to-the-philosophy-of-sankaradeva/.